Keep calling, and don’t restrict yourself to your senators’ DC offices. Each and every senator has several in-state offices. They’re populated mostly by actual staffers, not interns. Real people answer the phones — and if the one nearest you doesn’t pick up, you can call on down the line till you find someone at home. They’re often less crazed and more ready to listen, even to opposing views. My own experience: my wife’s family has a place in the Bath-Boothbay stretch of the Maine coast, and several family members who live up around the Penobscot Bay area. So I used that as the base from which I called Senator Collins’ Portland office, the one she lists as serving the county in which my in-laws hang. I told the nice lady who answered that I was grateful to the senator for coming out in opposition to the bill, that I agreed with her that it was bad for Maine, and that I was calling both to thank her and to emphasize that cosmetic changes to the bill won’t alter its underlying effects, which will still be bad for Maine. We talked about this for five or ten minutes and it was an actual conversation. How much effect will it have? Not that much. She knew I was only partly attached to Maine, so that’s a discount right there. But at least it lets that office and perhaps the senator know that we’re paying attention, and that we will continue to do so. And the fact that this was a conversation, an actual accumulation of reasons to worry about the bill matters quite a bit, I think. So the moral of the story: you don’t have to bash down the front door to reach someone who can reach closer to power. There are back doors, listed (with phone numbers) on every senators’ web page. 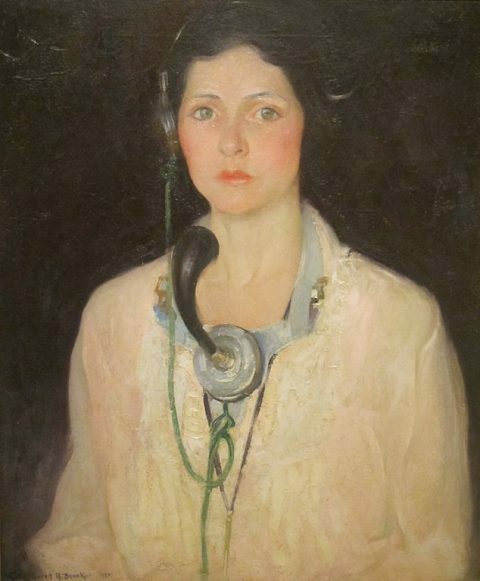 Image: Gerrit Beneker Telephone Operator (A Weaver of Public Thought), 1921. This entry was posted on June 27, 2017 at 4:46 pm and is filed under Health Care, Republican knavery. You can subscribe via RSS 2.0 feed to this post's comments. If Senators and Congress Reps care about one thing, it’s reelection and thus they are highly sensitive to one thing: the perception that they are seen as sharing the values of their constituents. It takes far less to sway them than most believe. And when we work in concert, our efforts are high impact. I would urge anybody who feels strongly about current events to join your local Indivisible group or Democratic club. Put in a couple hours a month and see firsthand what working together accomplishes.